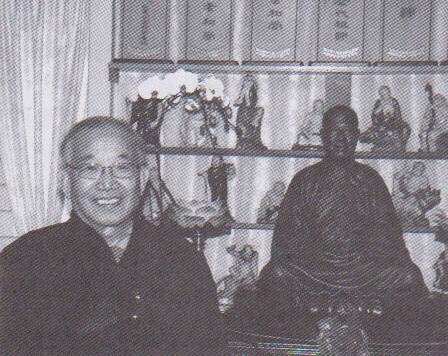 I look back at the first time I met Venerable Master some 29 years ago. This memory is still as fresh and clear as if it was just yesterday. It was the summer of 1983. Our family of five was on a road trip travelling from Seattle to California. On our way back, we drove on the 101 highway along the coastline in San Francisco and passed by the City of Ten Thousand Buddhas (CTTB). On the spur of the moment, we decided to go into the monastery to listen to the teachings of the Venerable Master. Venerable Master met with us. Our entire family suddenly had the urge to rake refuge in the Triple Jewels. Venerable Master was very kind and loving; the very next morning at 6a.m. he personally conducted a refuge ceremony especially for us. Roughly two months later, Venerable Master phoned and said he’ll be arriving in Seattle at around midnight in several days. I asked him why he chose to come at such a time, he simply said, “It's to save money on the donations that people have given us. The plane tickets at midnight are a lot cheaper!” That particular trip was actually for Venerable Master to decide whether or not he should purchase the Gold Summit Sagely Monastery on Minor Street in Seattle, and the Gold Buddha Monastery in Vancouver. He later asked a Dharma Master and two Vietnamese workers to help renovate Gold Summit Sagely Monastery, specifically reminding them to install 3x3x6 frames on the two side walls in the Buddha hall for the Bodhisattvas Wei Tuo and Sangharama. But somehow, the Dharma Master asked me to look for an artist to paint the Bodhisattvas on canvas and hang these paintings on the walls instead. Back then, the Chinese population in Seattle was very small, making it all the more difficult for me to find someone who could draw the images of the Bodhisattvas. I finally had to call my relatives in Taiwan to place a local order, but had to give up the idea later due to a six month delivery date. I thought hard for several days, and suddenly remembered that I once helped out a Dharma Master on importing his five Buddha statues. Perhaps he has the statues I want. So I phoned the Dharma Master and asked whether I could make use of the two of his the statues and place them at the Gold Summit Monastery My request was blissfully fulfilled. Looking back, I realize that Venerable Master already knew what was in the shipment going to Seattle; that it contained the two elegant white marble statues, the shipping event was testing my sincerity and devotion. Venerable Master cares very much about his lay disciples. He is very loving and kind and does not hesitate to help us our with our problems. Every time we met with Venerable Master, we would ask him to tap on our head so we received more wisdom. Towards his monastic disciples, Venerable Master was also very strict. Every week, we shared our own experience among ourselves right after meal time. A Dharma Master mentioned that sometime ago he looked out from the second floor and noticed two girls walking on the other side of the street. At that very moment, his phone rang! And it was Venerable Master calling him to say, You think those girls outside are really pretty? !” He was very shocked! And there was another time when he was in the evening recitation, he was not too happy with himself and vented out by hitting the wooden fish instrument harder than usual. Afterwards, the phone rang, and again it was from the Venerable Master. The Venerable asked, “Why the grouchiness and bad temper? The hitting was so loud!” Since then, he became very careful and cautious. Back then, we usually rented cars to attend ceremonies at the CTTB. One year, we had two fifteen-people vans and when we passed by the Clear Lake at around eleven o’clock at night, we noticed a very strong fragrance of incense. It lasted for roughly ten minutes. We finally arrived at the CTTB and saw that Venerable Master was actually still up, waiting for us in the reception room! Guo-Rong and I told the Venerable Master about the incense fragrance. The Venerable Master smiled and replied, “Of course! The Bodhisattvas were welcoming you!” These are my personal experiences I wanted to share with you. Amitofo!